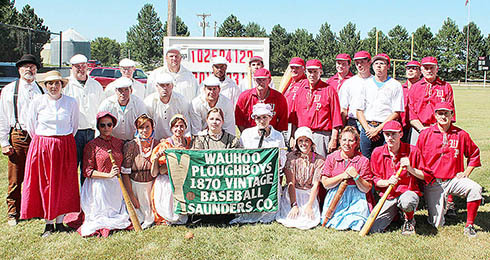 Tthe Petersburg and Wauhoo teams pose for a photo after their old time baseball game last Sunday. An Old Time Baseball game, originally scheduled as part of the Petersburg Q-125 Celebration back in 2012, had to be called off at that time due to lightning. The make-up game was played last Sunday, Aug. 14, at the Petersburg Park. 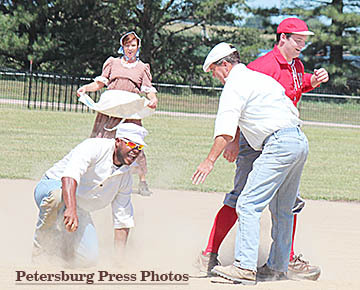 The game featured the Petersburg Sluggers vs. the Wauhoo Ploughboys. First, the players had to get accustomed to the old rules. Despite a couple of bad innings, but the Petersburg Sluggers battled hard in a 15-11 loss to the veteran Wauhoo team at the Petersburg field. The teams were playing by 1860s rules that governed everything from hurling (pitching) and striking (batting) to foul balls and fly outs. The ball and bats were homemade, and no gloves were allowed on defense. However, the lady players were allowed to catch fly balls with their aprons. In the spirit of the game, most players were given nicknames on the roster. Get the details in the Aug. 17 Albion News and Petersburg Press, Print and E-Editions. 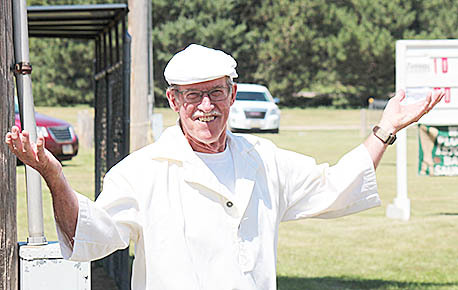 Coach Jerry ‘Yammer’ Thieman expresses his displeasure with ‘Blind Tom’ the umpire. Tyrell ‘Fuzzy’ Friese and Doug ‘Sparky’ Wright laugh after a dust-up at second base.